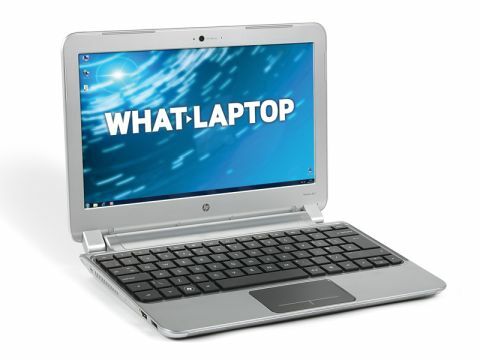 For many people searching for their perfect laptop, portability is a key factor. If you need something to entertain or keep you productive on the daily commute, you'll want a machine that's slim, light and has a great battery life. The HP Pavilion dm1-3100sa, at £349, ticks all three boxes, and comes highly recommended. At just 1.6kg, this is an ultra-portable laptop that can be effortlessly carried around all day. The 30mm chassis is also slender and compact, so will fit in almost any bag or briefcase with ease – making it perfect for regular travellers. You might be travelling without access to a plug socket, but we browsed the web while listening to music for five hours before the battery finally died. The brushed metal chassis feels solid enough to absorb any knocks it might take, which is another good feature for any machine that spends lots of time on the road. We also liked the dark patterned design on the HP Pavilion dm1-3100sa's lid, although it's a dust magnet – if you're a regular passenger on grimy British trains, be sure to pack a cloth. We loved this ultra-portable's screen, which is compact at 11.6 inches, but still suitable for browsing the web and similar tasks. It's a bright and vibrant panel that folds all the way back to horizontal, so viewing angles aren't a problem. Images are amazingly sharp, making this a great laptop for enjoying your home photos, although you can't watch DVDs thanks to the lack of an optical drive. If you wish to install software from a disc, you'll need an external USB drive. One of AMD's latest processors powers this laptop, backed up with 3GB of memory. We found that Office applications ran perfectly and browsing the web was a smooth experience, helped by the 802.11n wireless networking support. However, anyone hoping to play games or watch or edit HD movies will have to look elsewhere, as this laptop's multimedia potential is limited. This is down to the lack of dedicated graphics, with image rendering handled by the processor instead. This meant that HD videos skipped, ruining enjoyment. It will play standard-definition video, which is great for travelling or commuting, but the screen is too small to really enjoy movies anywhere but on public transport. A built-in webcam is a little grainy compared to some of the HD cameras we've seen lately, but it focuses perfectly with minimal motion blur. Other features are minimal, although you have 320GB of storage for carrying your files around, which isn't bad considering the compact chassis. This is enough room for thousands of photos and songs, and a huge amount of software. If you're bashing out a novel, you'll enjoy this laptop's keyboard, which spans the width of the chassis. Keys are well sized and nicely separated, using the popular isolation-style design. This is where each key protrudes through an individual hole cut into the chassis, so they're kept apart from their neighbours. The lack of gaps also means that crumbs and dust can't infiltrate your laptop's innards. Unfortunately, the touchpad is terrible. Our problem is with the mouse buttons, which are integrated into the pad itself. You have to push down the corners of the pad to simulate a left or right mouse click, and doing so often causes the cursor to skip about the screen. This is particularly annoying when you're trying to select tiny menu options in Windows. We lost count of how many times we selected the wrong option and gave up in the end and used a USB mouse instead. While it's something regular users would eventually get used to, our blood pressure soon hit the ceiling. Aside from the ropey touchpad, the HP Pavilion dm1-3100sa is a great ultra-portable laptop. At £349, it offers superb value for money, if you don't need bags of power for resource-hungry tasks such as video editing.